On track for their respective debuts, NASA’s Space Launch System (SLS) and Orion feature front and center in one of NASA’s latest evaluations for a mission to a deep space near-Earth asteroid (NEA). The conceptual mission, set after SLS’ opening salvo of flights, would send a crew of four on a yearlong voyage to study one of Earth’s nearest celestial neighbors. As the Space Launch System (SLS) program marches on, NASA’s Exploration Systems Development (ESD) team is working to define the destinations for SLS and its primary payload, Orion. NASA’s current vision for manned exploration destinations is the product of two key redirections in the agency’s recent history. In 2004, a year after the loss of Columbia and her crew, the birth of NASA’s Constellation Program (CxP) set course for a “Moon, Mars and Beyond” path for manned exploration. 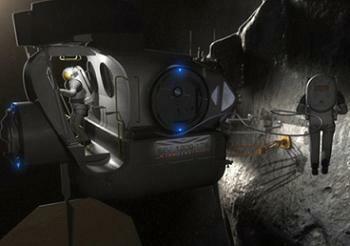 The cancellation of CxP in 2010 shifted the agency’s focus yet again, ending plans for an immediate return to the Moon. Instead, United States lawmakers directed NASA toward a loosely defined roadmap that allows manned missions to various deep-space destinations such as near-Earth asteroids (NEAs), culminating with a manned Mars landing. Under the new path, NASA has three distinct missions scheduled. Orion flies for the first time in September 2014, launching unmanned atop a Delta IV Heavy rocket on a mission dubbed “Exploration Flight Test -1” (EFT-1). The first flight of SLS, set for December 2017 and named “Exploration Mission -1” (EM-1), will send an unmanned Orion far past the moon, as a precurson to the first crewed mission four years later. Exploration Mission 2 (EM-2) will send a crewed Orion atop a SLS to rendezvous with and study an asteroid that is to be robotically captured in lunar orbit around two years in advance. While the destinations of EFT-1, EM-1 and EM-2 are fairly well defined, the missions beyond the initial three flights remain purely conceptual. Presented in NASA’s ESD team’s latest Concept of Operations (Con Ops) document (L2), “Design Reference Missions” (DRMs) are hypothetical missions examining the operational uses of emerging and proposed SLS program capabilities. DRMs give mission planners a sense of what can be accomplished during each upcoming iteration of SLS’ evolution, starting with the first generation of SLS hardware and working up to the fully evolved SLS. One such DRM, classified by NASA as an initial capability “strategic DRM”, envisions a SLS/Orion mission to a NEA using second generation SLS hardware known as Block 1A/B – a 105mT capable Heavy Lift Launch Vehicle (HLV). Lasting over a year and requiring two SLS launches, the mission would send four astronauts to study the asteroid 2000SG344. 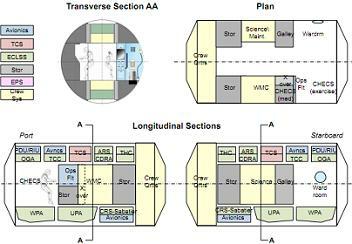 An initial capability NEA exploration mission would commence with the launch of an unmanned Block 1A/B SLS. Powered by four RS-25 engines, two advanced boosters and an upper stage consisting of a Block 1 Cryogenic Propulsion Stage (CPS), the first SLS would carry a Deep Space Habitat (DSH) and a Robotics and EVA Module (REM) into high Earth orbit (HEO). While both the DSH and the REM are classified as purely “notional,” NASA’s latest Con Ops document (L2) contains detailed plans for each module’s specifications. Equipped with solar arrays, docking ports and a maximum of 71.8 cubic meters of habitable space, the notional DSH would serve as a crew’s primary residence on a deep-space mission. The DSH, which would house most of a crew’s provisions and a host of spare supplies, could be divided into “separable pressurized volumes,” according to the Con Ops document. “The REM is an ‘add on’ airlock to other destination elements, consisting of a suitlock with two suitports, at least one robotic arm with a grapple fixture and EVA positioning end effectors, and an international docking system standard interface, ” the Con Ops document states. 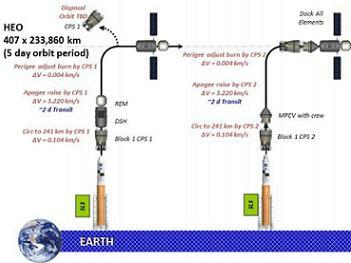 Once placed in HEO, the DSH and REM would spend 121 days loitering in orbit. Then, a second 105mT SLS would launch Orion and a crew of four on a course to rendezvous with the DSH and REM. Following rendezvous, Orion would dock with the DSH and REM and, using the second SLS’ CPS, perform the first of two HEO departure burns. The CPS then would be jettisoned and Orion would use the power of its service module (SM) engines for the second phase of HEO departure. 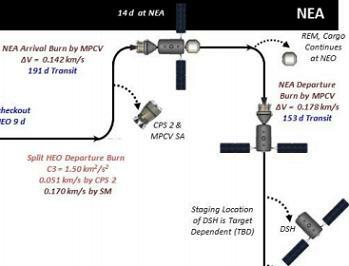 On Orion’s 202nd day in space, the vehicle would conduct a final burn to arrive at the targeted NEA. For the next fourteen days, the crew would don their Block 1 Deep Space EVA Suits and use the REM’s robotic capabilities to explore the asteroid. Upon conclusion of the fourteen-day exploration period, the crew would dispose of the REM. Orion, still docked to the DSH, would then perform a series of burns to separate from the REM and the asteroid, beginning a 153 day return to Earth. 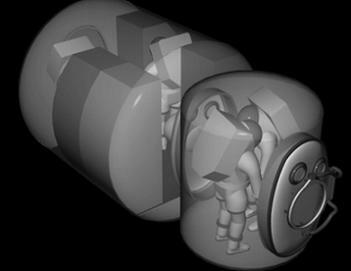 Two days before reentry and splashdown on Earth, the crew would transfer to Orion’s crew module (CM) and Orion would separate from the DSH. Finally, 490 days after the mission’s first SLS launch, Orion would jettison its SM, streak across Earth’s atmosphere, deploy its parachutes and splash down in the waters of its home world. While NASA’s DRM for an initial NEA visit likely will serve as the foundation for planning a similar mission in the future, at least some of a NEA mission’s components may be constructed by NASA’s international partners. For example, Astrium, the manufacturer of ESA’s Automated Transfer Vehicles, will build Orion’s SM. Given NASA Administrator Charlie Bolden’s recent efforts to gain cooperation from Asian space agencies regarding NEA visits, a NASA NEA mission may embody a deep-space extension of the longstanding international alliance displayed in the construction and maintenance of the International Space Station.